With 63 restaurants across North America in this Canadian, family-owned restaurant group, it’s hard not to call Earls a chain, but with 47 different menus, the use of local and regional ingredients, a team of award-winning chefs and different designs to each location, Earls is not your traditional chain restaurant. How Earls creates new dishes and designs their menu is also unusual. A team of diverse chefs, who come from both fine dining and hotel dining; independent restaurant dining, vegetarian dining and even high-end sports stadiums, work from Earls’ state-of-the-art Vancouver Test Kitchen. Individually they bring international experience such as Noma (Denmark), Alain Ducasse (France) and Zuni Café (California) – and they bring specialties in ethnic and vegetarian cuisine as well as both classic cooking techniques and modern new methods for use with the latest equipment. In 2013 Chef Dawn Doucette (Top Chef Canada, Zuni café) was already working in the Earls Test Kitchen. Chef Hamid Salimian (formerly Diva at the Met, Culinary Team Canada) became the first chef to join her and the “Chef Collective” followed by consulting Chef Jeff McInnis (formerly Yardbird, Miami and now his own restaurant, Root & Bone, New York); In 2014 Chef David Wong (formerly ORU and Fairmont Pacific Rim, Bocuse d’Or) moved to Earls Test Kitchen as well some young creative American and Vancouver chef consultants, which included Chef Tina Fineza. 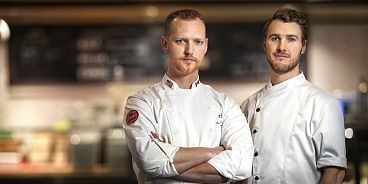 Chef Ryan Stone (formerly The Pear Tree with stages at Alain Ducasse and L ‘Atelier by Joël Robuchon, Culinary Olympics, Bocuse D’or) along with consulting vegetarian chef Brian Skinner (Acorn, Otarian, Noma, Gold Medal Plates) are now part of the Earls Chef Collective. Together in Earls Test Kitchen they collaborate. Chefs working together bringing new inspiration into Earls kitchens. They collaborate on new dishes and recipes, share knowledge and cook together to create new feature dishes, seasonal dishes, specific location menus (Vancouver, Toronto, Miami, Boston) and, what Earls hopes are, dishes that will become as much a part of Earls future menus as the well-loved dishesEarls guests are loyal to. For Earls, the restaurant that created the upscale casual dining mold – a level of dining embraced by independent restaurants and other chains – this is another example of breaking that mold and raising the bar yet again. 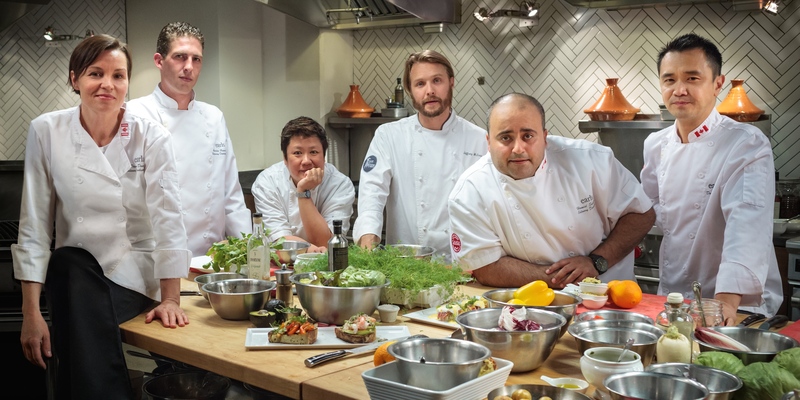 This spring Earls Chef Collective team is preparing to launch some exciting new menu items. From an authentic Korean Bibimbap (Chef Dave Wong) to some great new takes on vegetarian salads (Chef Brian Skinner), seafood (Chef Hamid Salimian), two new brunch items (Chefs Dawn Doucette and Ryan Stone), a new dessert and even a new burger. Dishes will launch in Earls flagship locations on March 25th, with most dishes moving to all Earls locations in June, along with new summer cocktails from Beverage Director, Cameron Bogue.